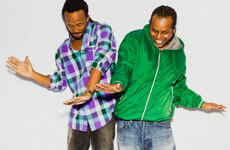 Madcon (short for Mad Conspiracy) is a Norwegian rap duo made of Tshawe Baqwa (Capricorn) en Yosef Wolde-Mariam (Critical). Their musical style is a retro-urban-mix with influences from funk, soul and hip hop (with additional elements and vibes from reggae, Latin and African in the finished product). Yosef & Tshawe blend singing and rapping in a unique and harmonious way. 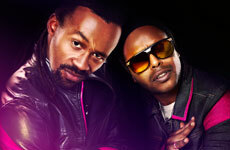 Live in concert, Madcon delivers an energetic musical showcase with a full band on stage. The experience is unique for the European music scene, best described as Outkast meets The Roots meets Black Eyed Peas meets Gnarls Barkley. After the huge international success of “Beggin” and the song-festival hit “Glow” they are back with a brand new single “Freaky Like Me”.